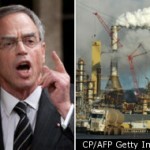 Let's get this right, extreme right – according to Joe Oliver, Minister of Natural Resources for Canada, all those climate change scientists and educators are "radicals funded by foreign interests", guilty of "exaggerated rhetoric", who should be "ashamed" of themselves for making "wildly inaccurate and exagerrated comments." So, who are these radical environmentalists? The targets of his ravings include James Hansen (pre-eminent climate change scientist from Cambridge University), Al Gore (Bush-whacked out of the U.S. presidency, climate change educator and Nobel Prize winner), and probably all of the contributing scientists to the upcoming 5th Report from the Intergovernmental Panel on Climate Change (IPCC). 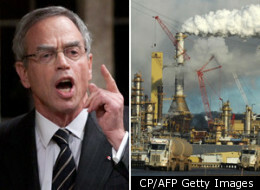 Now he is turning his attention to the European Union for daring to suggest that Alberta bitumen is "dirty oil." Yes, DIRTY OIL, according to the cap and trade, carbon pricing policies of EU Ministers seeking to reduce their carbon footprints and fulfill their Kyoto and Copenhagen commitments. Noble, but not in Canada's economic interests. Only yesterday, Oliver was attacking the European fuel-quality directive that labelled Canada's bitumen as dirty, claiming the EU draft document was "discriminatory towards Canadian oil and not supported by scientific facts." Discriminating, yes; not supported by science, no. I think it is worth mentionning, according to the most recent IHS CERA (Cambridge Energy Research Associates) reports, that the extraction of oil from bitumen produces 5 -15 times more greehouse gas emissions than conventional oil. So it is, without debate, a "dirtier" oil than conventional oil. Given that fact, and the overwhelming consensus by climate change scientists that human activities are responsible for the current accelerated rate of climate change, Dirty Joe eloquently responded, "I do not deny the problem, which is a fundamental problem." Really? Joe, you are full of dilbits. Yes, there is a problem, alright. To paraphrase Pogo, "We have found the enemy, and it is our Conservative government." In the wonderful children's story, Miss Rumphius, by Barbara Cooney, the young heroine declares that when she grows up she wants to be just like her grandfather, whom she adores, and must visit faraway places and live by the sea. Her wise grandfather tells her there is one more thing she must do, the most important: "You must make the world a beautiful place." Young Alice grows up and eventually discovers what she will do to make the world a more beautiful place. And she discovers it right in her own community. In my community, as in many this spring, volunteers are doing just that with a little spring "house cleaning" for their neighbourhoods. On Saturday, May 4, our local Tim Hortons and the Stafford family have organized the Caledon Community Clean-Up, to begin at 9:30am at the Caledon Centre for Recreation and Wellness at 14111 Hwy. 50. Participants will be provided with T-shirts, gloves, and collection bags (while quantities last). My family and I hope to see you there, working together to make our world a more beautiful place.